We were brought up to persevere. My sisters and I, in spite of the (very human) moments when we crumble in momentary self-pity, are not ones to fold. Maybe it was my dad’s incessant “if you were boys…” taunts, or maybe my mom’s unfaltering work ethic, but we do not enjoy being told what we cannot do. If something doesn’t work, you get up and you try again. There’s a This American Life episode* in which the journalist interviews a blind man who was raised believing that he could do anything a kid with sight could do. He was expected to –quite literallly — rise up from his inevitable trips and falls and try again. This is what led him to ride bikes, climb trees, and eventually teach other young blind kids that simply believing in their own abilities can give them something very close to normalcy in their lives. Giving them expectations, he says, is more than half the battle. I talk to Marc about this all of the time. I grew up with expectations of me; he did not. His were more self-imposed; mine came from multiple, albeit loving, familial sources. When we met as adults, those expectations were right there with us, perched on our shoulders as we sipped watered down cocktails at Neon’s. I had just finished law school, a direct result of my mother’s intense belief that I would be a “great” lawyer. He had just decided to purchase an apartment in downtown Cincinnati, a direct result of his own belief that he had no business living at his parents’ place. Over a year later, when we decided to move to Austin, it was a direct result of our mutual desire to find more from life than our hometown could offer, even if it meant the possibility of failure. The crushing reality of having expectations of yourself or others is that sometimes, the failure pill is hard to swallow. Schools deny your acceptance. Fairytale relationships end. Your child decides that she does not want to be a dentist. Your career in music just refuses to pay the bills. In the kitchen, my first real sense of failure came my sophomore year in college. I wanted to make macaroni and cheese from scratch, something my parents had made effortlessly for years, something I figured could not be complicated in the slightest. I expected so much from myself because I KNEW food. Like, more than anyone else. I was GOOD at this stuff. An hour and a bucket of tears later, I’m left with a watery mess of noodles with floating shreds of cheese sticking to the sides of the casserole. I was embarrassed, I was discouraged. For something so trivial, I took it incredibly hard. And then, I did what my little brain had been trained to do. I got up, blew my nose, and tried again. Because, you know, Frankes don’t fall down. Marc did not see the college apartment struggles, the train wreck weeknight meals, the pitiful excuses for baked goods. Sometimes I think it would help him through his own cooking conundrums if he had. I have failed in the kitchen so many times, propelled forward after each one by one very important expectation: I want to feed myself, and I am going to do it well. Last weekend was a true exercise in trial and error. It’s FINALLY cooling down in Texas, and the fall paraphernalia is incessant. They have pumpkin spice tortilla chips now, folks. 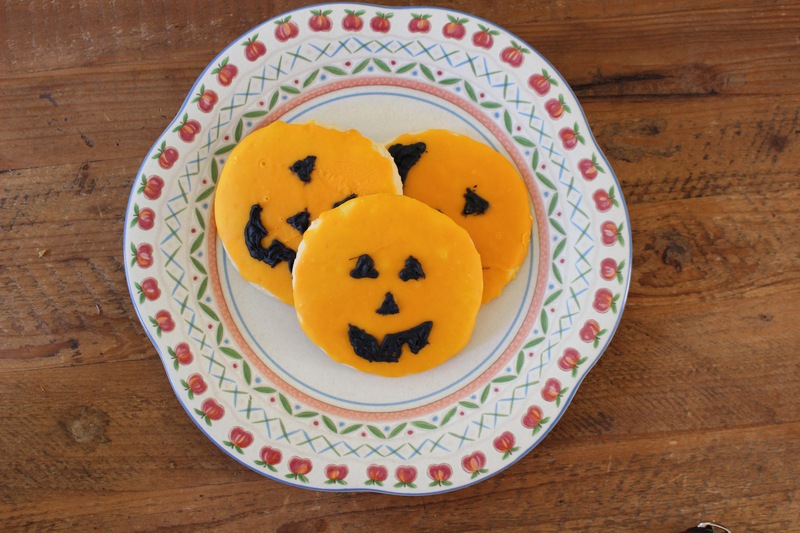 All I wanted, however, was a true-to-form sugar cookie with a jack-o-lantern face on it. There are two bakeries in my hometown–Busken and Servatti’s–that make these little wonders. 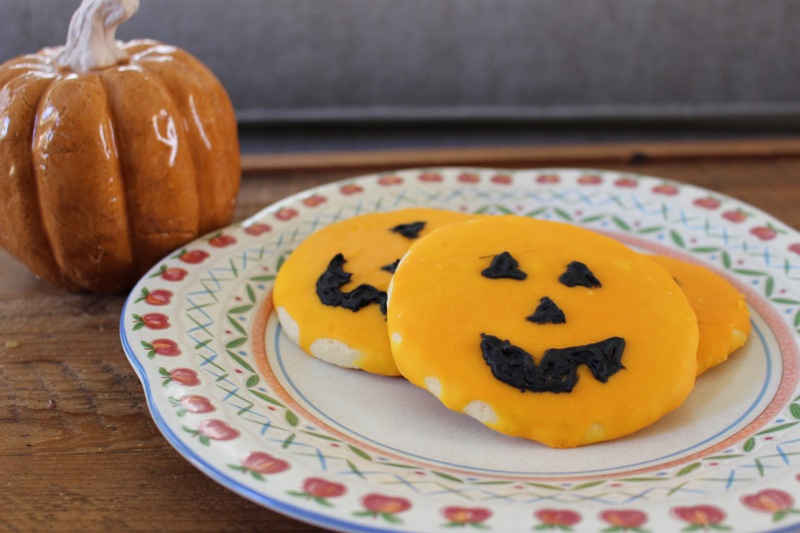 The sugar cookie looks to be the most basic thing, one covered in hard orange icing with a black crooked face on top, but the beauty of the Busken cookie is in its unmistakable flavor and texture. The secret? Almond extract. A lot of it. The OG Halloween cookie of the Cincinnati Busken Bakery variety. 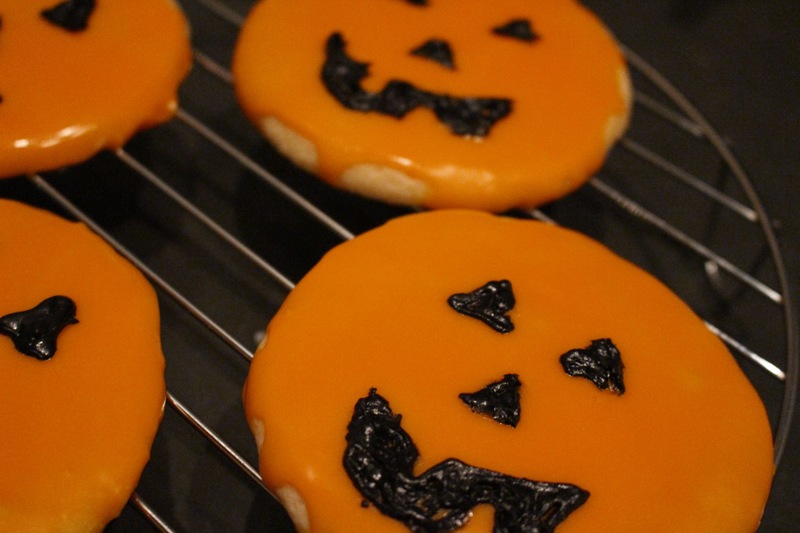 I searched every grocery store bakery for a Halloween-inspired sugar cookie with that key ingredient. No dice. So I bought the $4 bottle of extract and decided to try it at home. I’m not a star baker. I am for too impatient and much better suited for things cooked in large, heavy skillets where proportions are flexible. But I was dead set on this one, so I did something I rarely do. I made them twice. The first batch, made using a sketchy message board recipe, was weird. It called for salted butter, which I found strange, and baking soda, which only added to its too-savory quality. No vanilla. It suggested that I NOT refrigerate the dough, a must for most sugar cookies. Still, the result was a solid cookie with quite a bit of rise and the ability to hold its perfectly round shape. The icing though, while delicious, was lacking in that it refused to coat the cookie in that slow, Pepto Bismol type way that you want it to. It just kind of sat there. I had two Cincinnatians at my house at the time, and while they nodded approvingly at the first attempt, the cookie obviously did not meet their expectations or my own. They left for ACL, and I spent 3 hours trying, trying again. This time, I was more thoughtful. I used a different recipe, one that included comments below from actual Cincinnati bakery fans. I switched to unsalted butter. I chilled the dough. I bumped up the almond extract. I made sure to include vanilla, too. For the icing, I fine tuned my research. I found that corn syrup is the secret to shine for cookie icing, and added that in. I jacked up the almond extract once again. I sifted the powdered sugar. I TRIED HARDER. I spent three hours on the things, but the outcome was so incredibly satisfying and spot on. There is nothing like setting a goal and achieving it. It was the perfect way to cap off my weekend. On Monday morning, a girl in the elevator stared wide-eyed at the cookie in my hand and all was right with the world. I think my dad’s one-liner is a little off. Falling down is inevitable and maybe even necessary. You need the bad cookies to truly work toward and appreciate the good ones. The reason I like the line, however, is because it created a standard for me. It bounces off the walls of my brain, reminding me that I have the great expectation to remain standing, even when my knees start to buckle. *This particular episode brought in a segment from Invisibilia, another current podcast obsession of mine.